Be the first to share your favorite memory, photo or story of Kris. This memorial page is dedicated for family, friends and future generations to celebrate the life of their loved one. 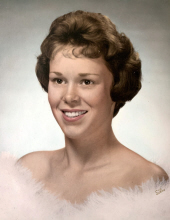 Linda Kristine “Kris” (Redman) Vaught, age 73 of Charleston, IL went home to be with the Lord on Sunday, April 14, 2019, surrounded by her family at home. Kris was born May 14, 1945 to Guy Benjamin and Lois Ann (Trimble) Redman. She married Carl William “Bill” Vaught on September 6, 1963 and they enjoyed 55 wonderful years together. Kris was a member of Wesley United Methodist Church in Charleston, IL. She enjoyed gardening, flowers, and baking, and she dearly loved her kids and grandkids. Kris was preceded in death by her parents and one sister. She is survived by her husband, two children: Megan (Rodney) Symonds of Charleston, IL, and Jeremy (Mary) Vaught of Mesa, AZ; and four grandchildren: Jilliann Symonds, Brynn Symonds, Michelle Valenzuela, and Angel Valenzuela. The family will hold a private graveside funeral. A Celebration of Life will be held at the Charleston Moose Lodge on Saturday, April 20, 2019 from 11:00 a.m. to 2:00 p.m.
For those who wish, memorials may be made to Carle Hospice or Charleston Fire Department. To send flowers or a remembrance gift to the family of Kris Vaught, please visit our Tribute Store. "Email Address" would like to share the life celebration of Kris Vaught. Click on the "link" to go to share a favorite memory or leave a condolence message for the family.